I have friends that I can’t trust for movie reviews because they love everything — which is great when you need a movie buddy! I am usually more selective, but when something I am a fan of hits the big screen my review has to be taken with a grain of salt. “The Fantastic Four?” Loved it. “Star Trek” reboots? Also loved. “The Simpsons Movie” – ditto. So I went into “The Lego Movie” upbeat and ready to see my favorite building blocks come to life. Luckily, though Vegbooks can be a forum for reviewers’ personal tastes, it is really a place to give other families a heads up about issues that may be unique to a compassionate lifestyle so here we go (also: generalized spoiler alert from here on out)! The plot starts out as your quintessential hero’s journey,* but there is a live action component as well that culminates in the realization that the world of construction worker minifigure Emmett is in the basement of an AFOL (“adult fan of lego”) played by Will Ferrell (who also voices the villain, Lord Business). The son of Will Ferrell’s character has been playing with his father’s well segregated Lego models (no mixing between the western themed sets and the city or pirate themed sets, for example). To retaliate, Ferrell’s character begins gluing his own models and figures together so that they can remain pristine for display. Luckily, he sees reason by the end and there is a satisfyingly happy ending for both minifigures and humans. Other reviews have covered in more detail the clash between the world of step-by-step instructions and free play, but I have been guilty of keeping “my” lego sets away from my kids and not letting them mix pieces between sets though I have been getting better about it. My 3-1/2-year-old son and 5-1/2-year-old daughter both were engaged by the film. They enjoyed it though caregivers will want to know that it is very much an action movie. Bricks blast apart (and come back together) very quickly and with thundering sound usually reserved for summer blockbusters. My mother-in-law thought it was a cute movie but remarked at the fast pace hindering the ability to follow some of the building that was going on. There is a “death” in the form of a minifigure head popping off and I could see my daughter tear up then, as well as when a city of sorts is destroyed while one of its denizens looks on and tries to hold back tears of her own. The movie never forgets that these are toys engaged in imaginary play, however, so the filmmakers have no qualms popping a ghost-like piece over the headless Lego figure and having him advise the protagonist from beyond, which served as great comic relief complete with mock spooky ghost sounds. Veg families should be aware that there are a few peripheral meat references, relating to drumstick (exhibit A), sausage (exhibit B), and taco pieces. The level of action in the movie also surprised me, given Lego’s reputation for positioning itself as non-violent (a stance that has eroded over the years especially with licensed sets) but I felt it was true to the concept of Lego. In researching the origin of this policy in favor of non-violence so I could offer a source, I found this advertisement relating to peace, which lead me to remember this girl-power advertisement, which leads me to cover briefly the role of women in “The Lego Movie.” The last film my family saw in the theater was Disney’s “Frozen” (great discussion of the female themes in that movie here). 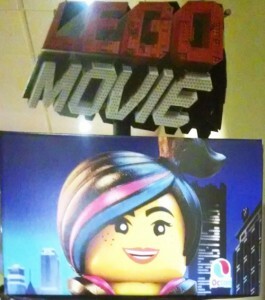 The main female character in “The Lego Movie,” Wyldstyle, is a Master Builder that is also a little insecure. A large portion of her storyline involves her trying to call attention to her relationship with her boyfriend Batman (expertly voiced by Will Arnett) and some burgeoning chemistry between her and Emmet. Wyldstyle is able to give a speech that rallies the Lego population, which I loved, but then the movie does culminate with her making a romantic connection with Emmet. The other major female character is a unicorn/kitty hybrid named UniKitty that is mostly cuteness and rainbows. Some missed opportunities there, to be sure, but I know my imaginary games with my sisters involving Lego always featured romance and female stereotypes, and we all turned out just fine. Verdict: I loved the movie and will be buying it for our home library when it is released, but if you have very small children you may want to skip the theater because of all the action and wait to check it out in the comfort of your own home. * For more information on the hero’s journey archetype, I highly recommend Joseph Campbell’s The Hero With a Thousand Faces. Thanks for covering the role of women/girls in the movie – I was curious! Thank you for this wonderful and detailed review. Everyone who has seen it has raved, and that always makes me suspicious. But seeing this, I guess it’s deserved! Thanks for your review. I was wondering about girls in the movie. I came across this review about the gender equality in the movie as well. Looks like there is still some work to be done on that end.